Hyperpigment can come from multiple things. When getting a tattoo removed good sun protection is a must. If you have a treatment and then expose that area to sun damage you are at a higher risk of getting hyper pigmentation (because this is skin that ink is being removed from) so it is more sensitive to sun. Using an SPF high in Zinc and SPF 50 applying this every hour can help prevent sun damage. Massaging the areas of where your tattoo is (after it's healed) can be very helpful in removing ink as well. Any time you massage a part of your body, your body brings blood to that area, so this can help pull more ink. 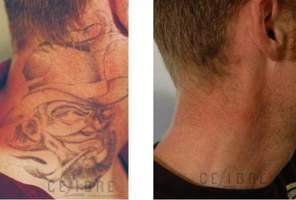 Depending on where your tattoos are and how much ink treatments range differently. If your tattoos are on an upper body part they can go much faster because there is a better blood supply. On the lower extremities they take longer because they are further from the heart, so less blood supply. We use the Cutera Enlighten laser and I can say that with this laser we have seen treatments cut in half. We also explain to all of our patients the importance of post care and sun exposure.